We stayed 5 nights in Maria Poggi's lovely apartment in Camogli. It had everything we needed as far as space for 3 people went. Well stocked kitchen, space to spare. The stairs are only for the fit - this is a fourth floor walk-up and the stairs are steep and narrow - by the end of the stay, we were all a lot fitter. This is something to bear in mind if traveling with young kids or anyone who might have a problem with stairs - then again, all of Camogli is stairs :) The apartment is ideally located for our favorite fish store (next to the front door), grocery store, bakery (lets hear it for the focaccia at Revello) and the fresh pasta store. There's also a weekly market that is great for all kinds of goods. We did have an issue with the lack of internet accessibility - the apartment was listed as having internet and one of our party did need to check work messages on a regular basis - Maria offered to reimburse us for the absence of connectivity. Our solution was to use the free internet at the delightful Tre Merli cafe, just a short walk to the waterfront each morning. That way we got to catch up on messages, have a great cup of coffee and watch the town wake up. We thanks for the detailed description of the apartment. Right: the stairs are not for everyone! To avoid any unpleasant surprises to our guests we always notice there are 70 steps. For someone it could be inconvenience, even if the beach is 50 meters from the apartment. Thank you for reporting us the wi-fi problem. Even if on the web site we wrote we have wi fi "On request (no additional cost)" we must to avoid misunderstandings about wi fi. Now we have a USB key 7 Giga but we realized it is an old connection system. So in the coming days we will put wi-fi inside the apartment. 2012 was our 4th consecutive year renting this apartment for 5 weeks each summer. We return every year for all of the reasons I cited in the testimonial I wrote after our first stay in 2009. If the description fits your needs and interests, you will not be disappointed. We especially appreciate the manager's helpful and friendly assistance. We had a lovely stay at this apartment in Camogli. The location couldn't be better in the old town with a bakery, fish market, fresh pasta shops, beach, and nice restaurants within a stone's throw. The owners were very accommodating to our group and the apartment was clean and functional. We hope to stay there again sometime soon. "Excellent Communication, Charming Apartment, Perfect Location, Marvellous Host - Highly Recommended!" 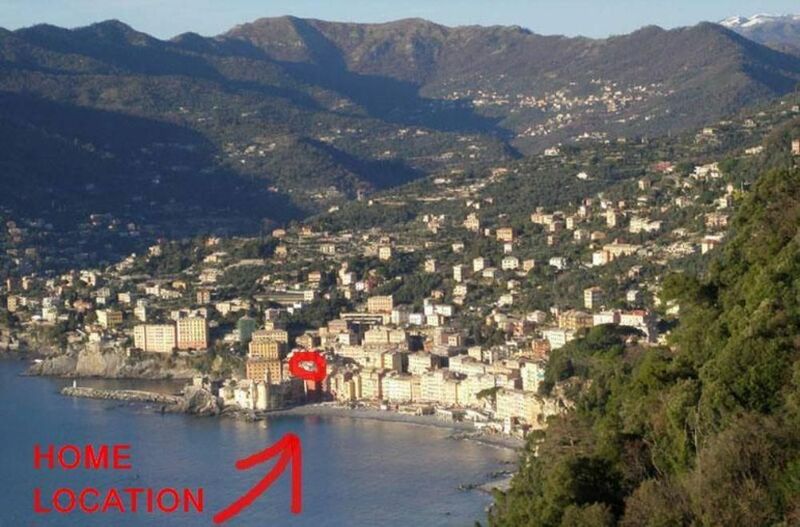 "This apartment is excellently situated in the heart of Camogli's historical centre and extremely convenient. Camogli comes alive in the evenings in August, so if early nights are your thing, then the heart of Camogli may not be for you (we slept with the windows closed and air con on, which worked well). The apartment itself was absolutely spotless and very well furnished. The owners were extremely helpful and courteous, kindly providing beach towels for us and thoughtfully setting up a travel cot (even though we brought our own) because they remembered we had an infant. There are lovely views from the windows of the rooftops, castle and sea, but I would be most careful with young children (under-3's) as the mezzanine window is opened extremely easily - The owners do warn you of this in their information booklet and are aware that something needs to be done about it. For slightly older children, the mezzanine was a perfect place to create a kids' space (although it was very hot up there in August). There is quite a hike to the top floor, especially with suitcases and young children, but if you take it slowly, you become accustomed to them. Anyway, the steps are a part of Camogli's charm and history so it would be a shame to miss them! One last point: the coffee machine was heavenly and even got a thumbs up from our Neapolitan relatives!" "Nice city but a lot of people in august, appartament good, clean ,nice owner,good seefood market (shop) at the ground flour"
(Text automatically translated) The Airport of Genoa is located about 30 minutes, the train station is about 300 meters, the toll Recco motorway is 4 km.